Kyle DuBuc was first elected to the city commission in November, 2011. He has fifteen years of professional public policy experience including five years advocating for the rights of seniors and people with disabilities with Michigan Protection & Advocacy Service and four years as the legislative director for an Oakland County lawmaker. 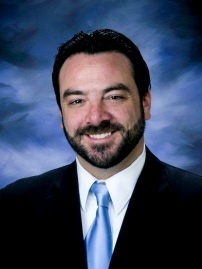 He is currently employed as Director of Public Policy & Advocacy at United Way for Southeastern Michigan. Kyle earned a BA in Community Relations from Michigan State University in 2000. He served several years with the Peace Corps in Niger, West Africa and he has a long history of volunteerism and community involvement. He and his wife, Tara, have been married for thirteen years and they have three young children. During his tenure on the commission, Kyle has served on the Commission for the Arts, the Senior Citizens Advisory Committee, the Environmental Advisory Board, Housing Rehab Board of Appeals, and City/School Liaison committee, as well as the Employee Retirement and Pension Boards.